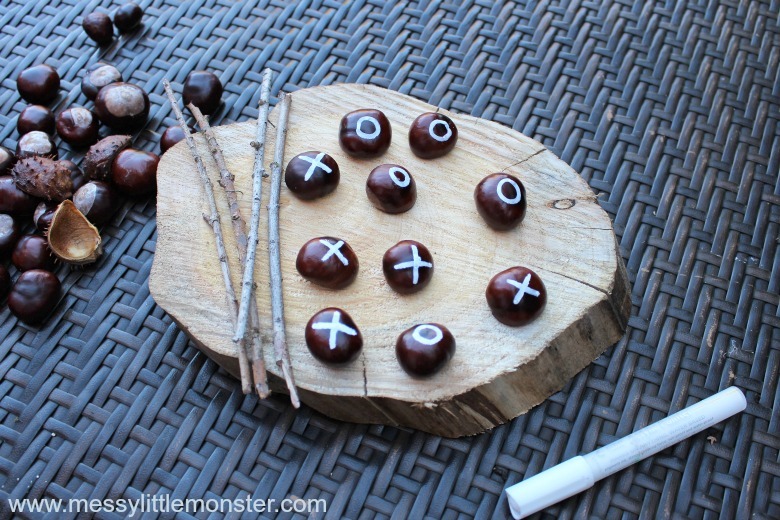 We love nature crafts for kids and this diy tic-tac-toe game is so much fun to make and play with! 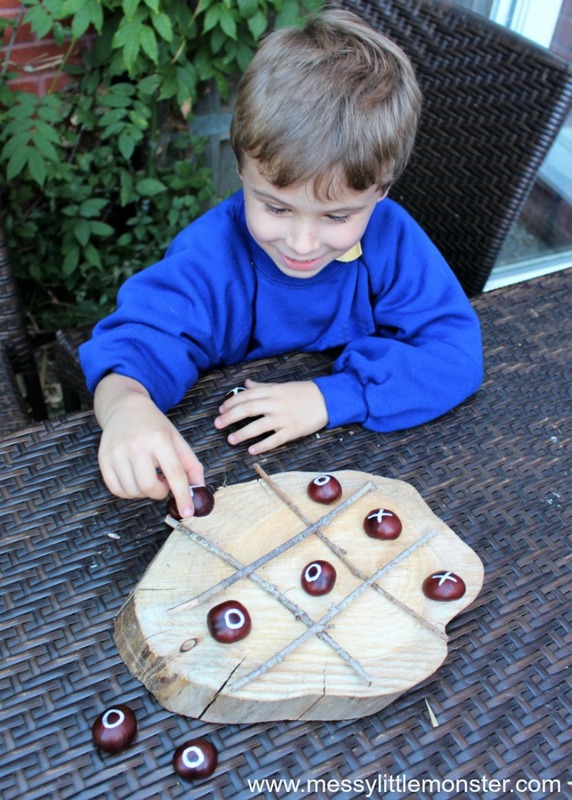 Using just a few conkers (or rocks), sticks and a slice of wood you can make your own tic-tac-toe game (also known as naughts and crosses or X's and O's!) 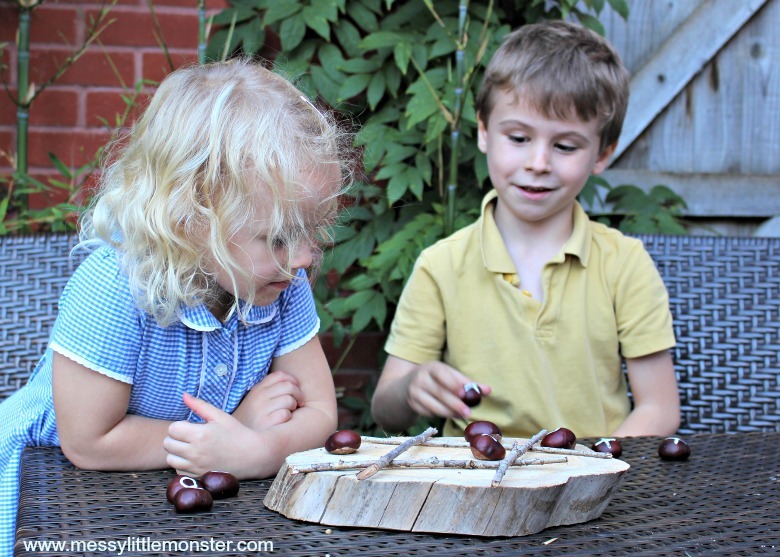 What a perfect backyard game to keep the kids entertained on a warm autumn afternoon! 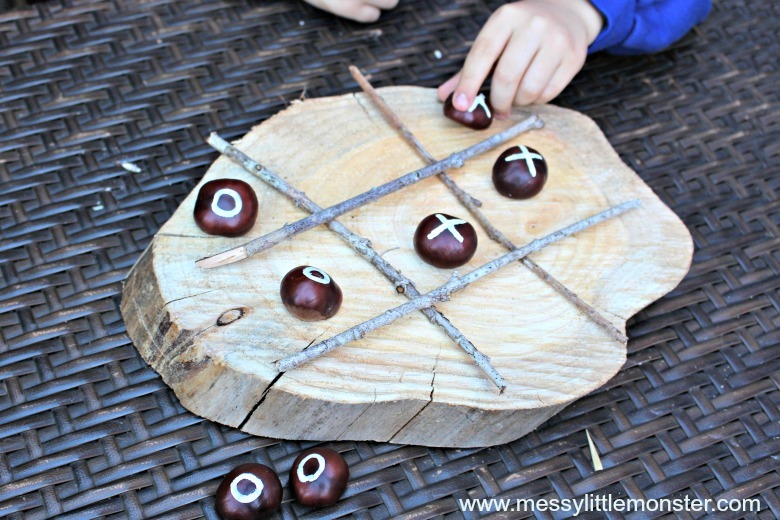 If you love nature crafts for kids as much as we do you might want to try a few of our other nature crafts as well as making this tic-tac-toe game. You could make a set of cute conker spiders, some leaf puppets or a nature suncatcher craft. 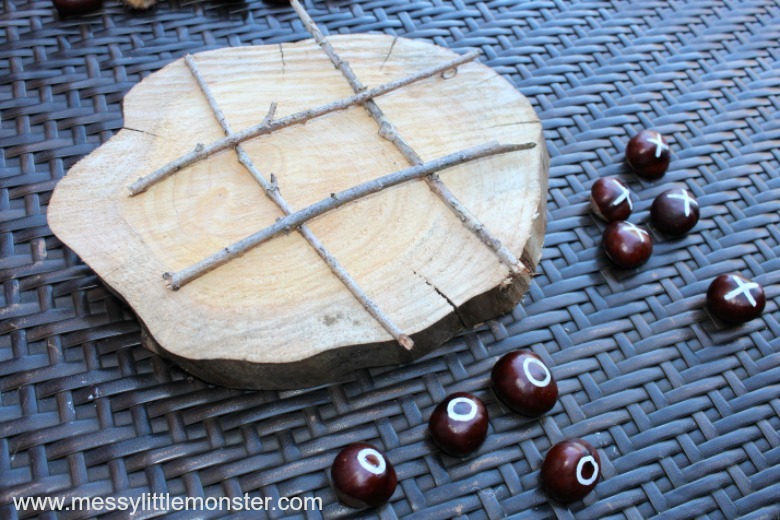 Before making your diy tic-tac-toe game you will need to head outdoors and collect some pieces of nature. While you are out collecting all your supplies why not go on a nature scavenger hunt! 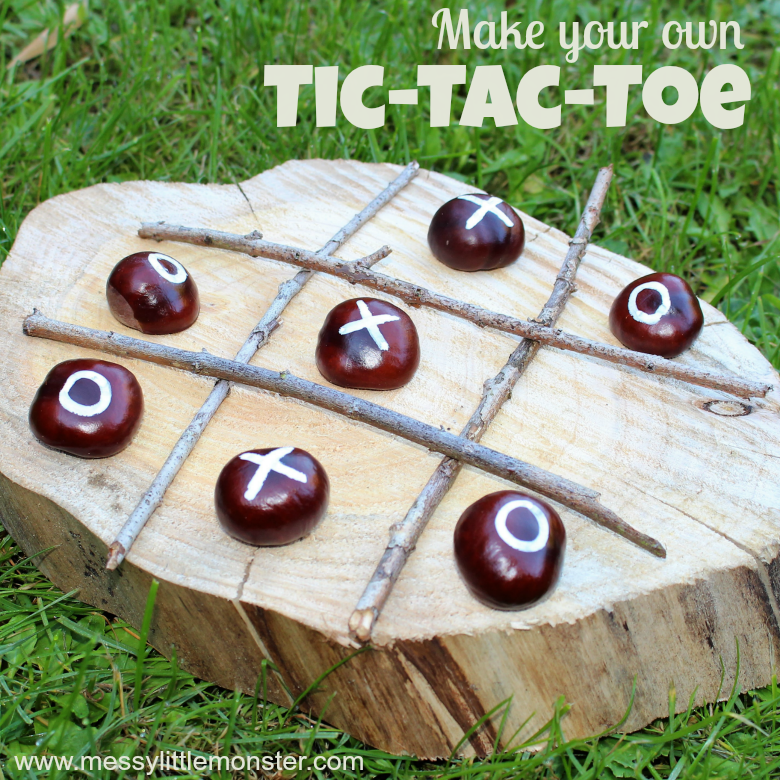 Below you will find step by step instructions for making your own diy tic-tac-toe game. 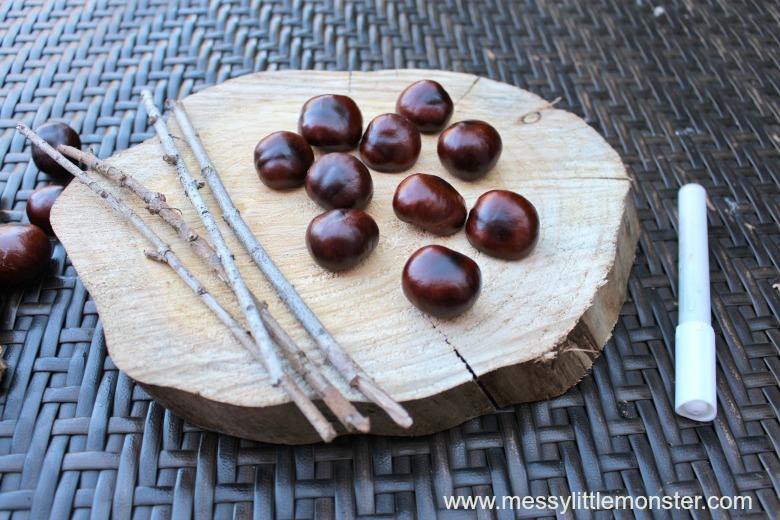 We had a huge collection of conkers (seeds of horse chestnut trees), so we wanted to have a go at making some conkers crafts, but if you don't have any conkers rocks work well too! I've supplied links to Amazon for easy purchasing! Just click the links below to be taken to the product pages. As an Amazon Associate I earn from qualifying purchases at no extra cost to you. Thank you for supporting our work. STEP 1: Collect your nature! The first step towards making this nature craft is to get outdoors and have fun collecting all your supplies! You will need to find something to use as your tic-tac-toe board, a woodslice works perfectly, but you could use any surface. Once you have decided what you are using as your tic-tac-toe board you need to collect 4 sticks that are a similar length to your board. Try to find thin, straight sticks if you can. 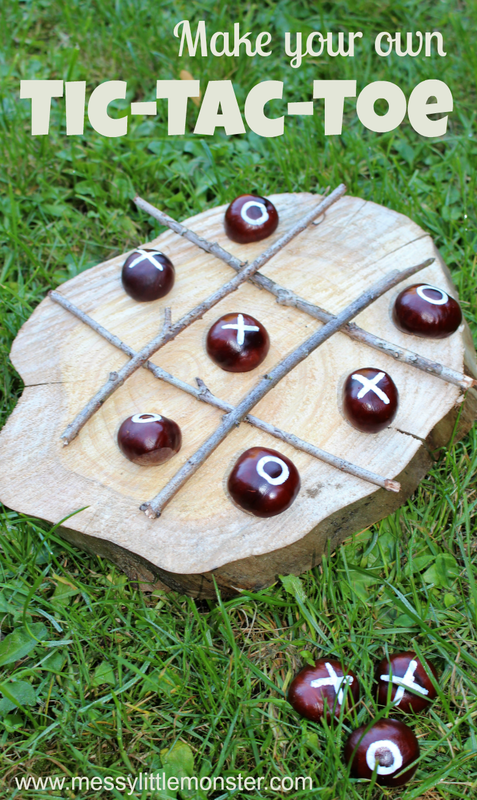 For your X and O counters you could use conkers or rocks. We decided to use conkers as we have a huge collection of them after our nature walk last weekend. Now you have all your supplies you are ready to start making your tic-tac-toe game. Using an acryic paint pen draw an X on 5 of your conkers (or rocks) and O on another 5. These will be your counters. I would suggest using a light coloured acrylic paint pen for drawing on your conkers so that the X's and O's really stand out. Spray the conkers with sealant to protect the paint. Use the sticks that you have collected to create a 3x3 grid on your board. (see picture below) We set up our 3x3 grid on a wood slice but you could set it up anywhere! STEP 4: Enjoy playing Tic-Tac-Toe! Your diy tic-tac-toe game is now complete and ready to be played with! The kids will love playing this game either with you, with siblings or with friends. I'm sure most people know how to play Tic-Tac-Toe (also know as naughts and crosses or X's and O's) as it is one of those games that is played over and over in different forms. Tic-Tac-Toe is a two person game where you take it in turns to place an X or an O inside one of the spaces on a 3x3 grid. One player will use the X counters and one will use the O counters. When one player has a row of three X's or O's they have won the game. You can make a row horizontally, vertically or diagonally. 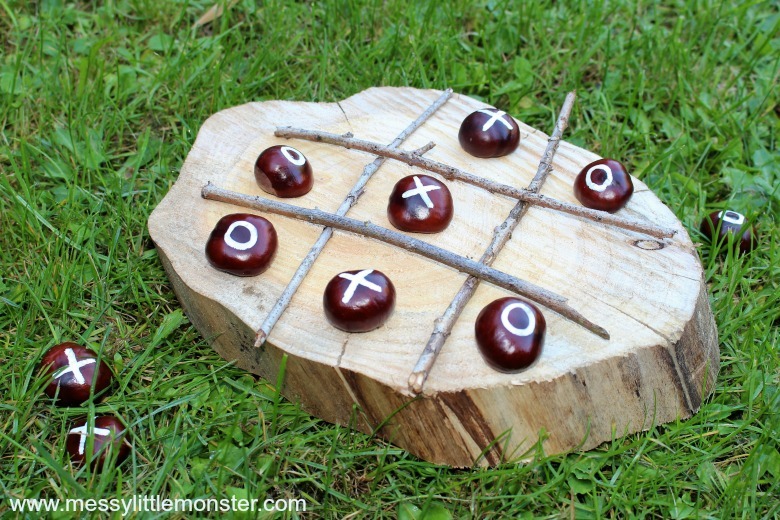 I made this tic tac toe game as a surprise for the children when they came home from school using a few of the conkers that they collected over the weekend. Harry (aged 7) and Daisy (aged 4) both loved this simple backyard game and played several games straight away. Now I have to think of some more conkers crafts for the rest of the collection! What do you call this diy game? Tic-tac-toe? Naughts and crosses? X's and O's? Whatever you call it we hope that you and the kids enjoy making and playing with this easy nature craft for kids. We would love to see how you make your own diy tic-tac-toe game!